Leptus sp., photographed by Tom Murray. Leptus is a cosmopolitan genus of erythraeid mites in which the single pair of eyes is placed relatively close to the front of the main body. Larvae are found on a wide range of hosts, including almost all terrestrial arachnids and insects. The type species Leptus phalangii was, as its name indicates, first described as a larva parasitising a harvestman in Sweden. Adults were initially described as belonging to a genus Achorolophus, until rearing experiments established the association of larvae and adults (Southcott 1961). Characters (from Southcott 1961): Idiosoma with one eye on each side, placed in the adult and nymph alongside the anterior half of the crista. Crista of adult and nymph with two sensillary areas, the anterior at the apex of the propodosoma, and the posterior at the posterior end of the crista. Larva with a triangular dorsal scutum, the apex posterior, and with two pairs of scutalae placed anterolaterally; two pairs of scutal sensillae present, one pair anteromedian, at about the level of the AL scutalae; posterior pair at or near posterior pole of scutum; larval lateral (neolateral) tarsal claws dissimilar. [CM07] Cokendolpher, J. C., & P. G. Mitov. 2007. Natural enemies. In: Pinto-da-Rocha, R., G. Machado & G. Giribet (eds) Harvestmen: The Biology of Opiliones pp. 339–373. Harvard University Press: Cambridge (Massachusetts). [GF11] Gabryś, G., M. Felska, A. Kłosińska, W. Staręga & J. Mąkol. 2011. Harvestmen (Opiliones) as hosts of Parasitengona (Acari: Actinotrichida, Prostigmata) larvae. Journal of Arachnology 39 (2): 349–351. [H09] Haitlinger, R. 2009. Three new species of mites (Acari: Prostigmata: Erythraeidae) from the Republic of Cape Verde. Biologia 64 (6): 1150–1156. [MF11] Mąkol, J., & M. Felska. 2011. 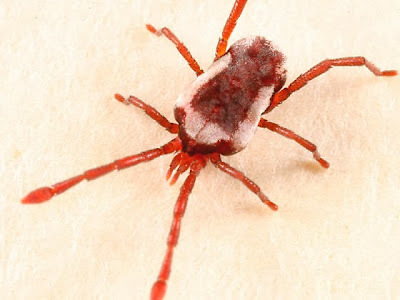 New records of spiders (Araneae) as hosts of terrestrial Parasitengona mites (Acari: Actinotrichida: Prostigmata). Journal of Arachnology 39 (2): 352–354. [SB63] Schweizer, J., & C. Bader. 1963. Die Landmilben der Schweiz (Mittelland, Jura und Alpen): Trombidiformes Reuter, mit 217 Arten und Unterarten und 193 Originalzeichnungen. Denkschriften der Schweizerischen Naturforschenden Gesellschaft [Mémoires de la Société Helvétique des Sciences Naturelles] 84 (2): i–vi, 209–378. [S76] Shiba, M. 1976. Taxonomic investigation on free-living Prostigmata from the Malay Peninsula. Nature and Life in Southeast Asia 7: 83–229. [S61] Southcott, R. V. 1961. Studies on the systematics and biology of the Erythraeoidea (Acarina), with a critical revision of the genera and subfamilies. Australian Journal of Zoology 9: 367–610. [S91a] Southcott, R. V. 1991a. A further revision of Charletonia (Acarina: Erythraeidae) based on larvae, protonymphs and deutonymphs. Invertebrate Taxonomy 5: 61–131. [S91b] Southcott, R. V. 1991b. Descriptions of larval Leptus (Acarina: Erythraeidae) ectoparasitic on Australian Diptera, and two earlier described Australian larvae. Invertebrate Taxonomy 5: 717–763. [T04] Trägårdh, I. 1904. Fauna Arctica: Eine Zusammenstellung der arktischen Tierformen, mit besonderer Berücksichtigung des Spitzbergen-Gebietes auf Grund der Ergebnisse der Deutschen Expedition in das Nördliche Eismeer im Jahre 1898 vol. 4 pt 1. Monographie der arktischen Acariden. Gustav Fischer: Jena. [V25] Vitzthum, H. 1925. Fauna sumatrensis. (Beitrag no. 5). Acarinae. Supplementa Entomologica 11: 1–79. [WL09] Walter, D. E., E. E. Lindquist, I. M. Smith, D. R. Cook & G. W. Krantz. 2009. Order Trombidiformes. In: Krantz, G. W., & D. E. Walter (eds) A Manual of Acarology 3rd ed. pp. 233–420. Texas Tech University Press. [WY88] Welbourn, W. C., & O. P. Young. 1988. Mites parasitic on spiders, with a description of a new species of Eutrombidium (Acari, Eutrombidiidae). Journal of Arachnology 16: 373–385. [W91] Witte, H. 1991. Indirect sperm transfer in prostigmatic mites from a phylogenetic viewpoint. In: Schuster, R., & P. W. Murphy (eds) The Acari: Reproduction, development and life-history strategies pp. 137–176. Chapman & Hall: London. [WWO01] Wohltmann, A., H. Witte & R. Olomski. 2001. Organismal patterns causing high potential for adaptive radiation in Parasitengonae (Acari: Prostigmata). In: Halliday, R. B., D. E. Walter, H. C. Proctor, R. A. Norton & M. J. Colloff (eds) Acarology: Proceedings of the 10th International Congress pp. 83–99. CSIRO Publishing: Melbourne. Last updated: 27 March 2018.